Kanye West's Yeezy show gets everyone talking at New York Fashion Week | HELLO! Kanye West has definitely got people talking following the launch of his Yeezy 4 collection at New York Fashion Week. 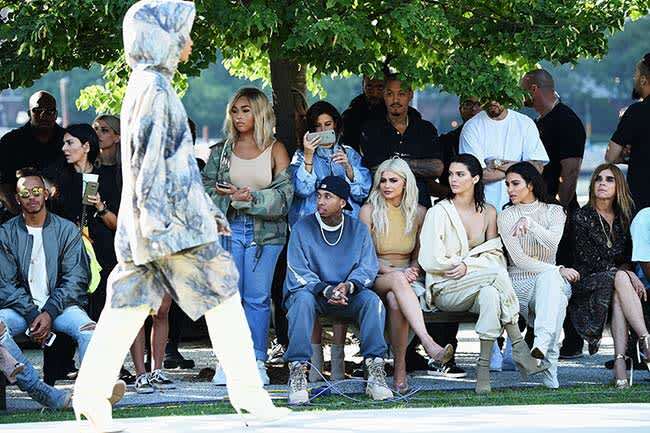 Despite attracting a number of high profile faces including Anna Wintour and Pharrell Williams, not to mention Kanye's loyal wife Kim Kardashian, the show was not without its problems, starting with a two-hour delay. Guests were reportedly left waiting on buses while waiting for Kanye's arrival, with many left struggling in the 30⁰C heat. At least one model is believed to have fainted, while others resorted to taking a quick sit down when the opportunity arose. Among the recognisable models in the show were Chanel Iman and Justin Bieber's girlfriend Sofia Richie. The 18-year-old looked poised as she walked in a yellow hooded coat and over-the-knee boots, but later admitted on Instagram that she had struggled in the heat. "The heat today in NY was not chill. At all," she wrote. Sofia fared better than some of the other models though, as others had difficulty walking in the shoes and boots from Kanye's collection. While one model resorted to taking her shoes off in the middle of the runway, another nearly fell over when the heel snapped on her over-the-knee boots. Lots of shoes breaking today at #YEEZYSEASON4 - But the clothes look good! The moment can be seen in a video shared on Instagram by fashion writer Zachary Weiss, who wrote: "Lots of shoes breaking today at #YEEZYSEASON4 – But the clothes look good!" Difficulties aside, Kanye still received a lot of support from his friends and family, including Kim Kardashian, Kendall and Kylie Jenner, plus her boyfriend Tyga. The group sat front row with Carine Roitfeld, Pharrell Williams and Lewis Hamilton, whose rumoured girlfriend Winnie Harlow was also in attendance. The group gave Kanye a standing ovation as the show came to an end, but have yet to comment on the show on social media.